Keep checking back here for more and more gardens open to the general public on Open Garden Day - Saturday 19th November! 3000's Saxon St Garden will be open from 1pm-3pm and will include a garden tour! A new shared community garden within the grounds of the old primary school site at 33 Saxon st, tucked in behind the Brunswick Baths. An ongoing project in collaboration with Moreland city council - watch this space for more information as to exciting upcoming events, workshops and veggies to share! Come visit the CERES Organic Farm and meet our Propagators and Market Gardeners. Wander through our farm and learn about how we propagate and grow produce organically. A chance to get some garden advice and to participate in a propagation activity. Lulie st, Abbotsford. Next to Victoria Park train station. The garden will be open from 10am until 1pm. From 10am-12pm we will be hosting an integrated Pest Management session! For more info, you can reach us here. The market garden is open between 9am to 1pm. We hold a farm gate stall each Saturday which stocks our produce grown on site and a few other local organic producers. Coffee and tea will be available on the day. Come visit the community gardens and learn about how we grow produce organically. The chicken area will also be open for a tour and advice. Please email ceres.community.gardens@gmail.com for more information. On 19th November West Brunswick Community Garden & Food Forest will be holding a Permablitz and although we have filled our volunteer quota, we welcome visitors who might like to come and see a blitz in action and have a look around this hidden oasis of urban Ag in Melbourne's inner north. 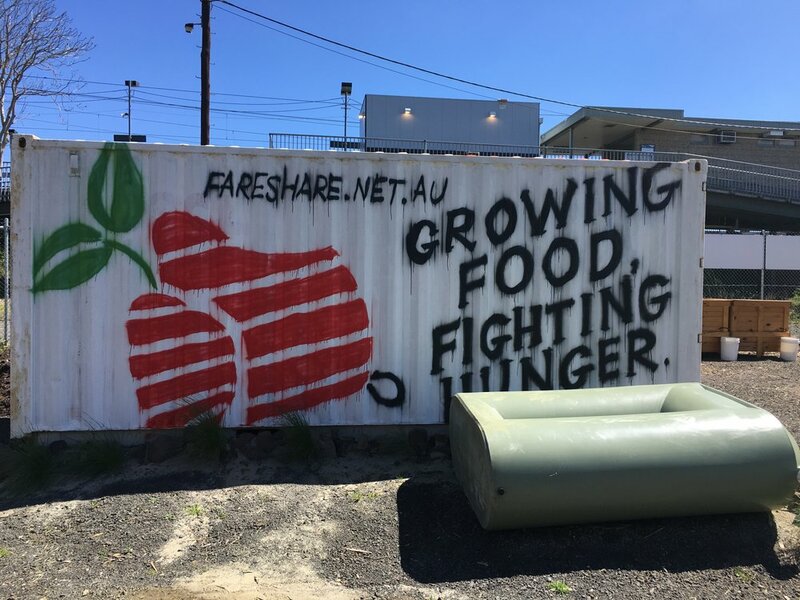 Established more than 15 years ago, the community garden and food forest have been rejuvenated over the last few years by Moreland Community Gardening - a group of locals determined to help more people grow food together. The blitz will start at 10am and end around 4pm. Feel free to drop in during that time. It will be a busy working day in the food forest and there won't be organised tours but members of the group will be around and can chat about the garden and answer questions. Private address in Thornbury, provided after booking has been made. 10AM - 11AM: This is a tour of Robbie's amazing aquaponics system and associated food garden. Featured in his book Edible Garden Designs, Jamie Durie writes “This family is the very model of environmental awareness”. Robbie’s garden has also been in The Age, Sydney Morning Herald, ABC Melbourne, 3AW, Good Organic Gardening and Sanctuary Magazine. Both front and back yards are devoted to food production, and feature two aquaponics systems in which trout and vegetables are grown in a mutually dependent relationship, enabling both to thrive. One system is homemade while the other is a purchased kit, and both are seamlessly incorporated into rest of the garden, which produces a huge variety of vegetables and herbs. Composting and free-range chickens also contribute to this garden’s sustainability credentials. To book, please click here. 11.15AM - 12.15PM: You are invited to participate in a workshop where Robbie will introduce you to the basic principles and benefits of aquaponics, provide an overview of backyard style designs, the equipment you will need and how to set up a system from scratch. He will also address the common problems with stabilising and establishing a new system, as well as ongoing maintenance. We're opening the garden for anyone who is keen to know more about our history AND there are a few plots vacant if you were keen to join our little community of passionate gardeners! Gold coin donation would be appreciated which includes morning tea. For more info, please us at Bernieh@sunburychc.org.au. Private address in Reservoir. Address provided on booking. 12:45PM - 1:45PM: This is a tour of Lee's private garden. Lee is passionate about sharing the health and wellbeing benefits of tending to and eating from her bountiful garden in her social housing estate. She wanted to break down the perception that many of her neighbours had that food gardening is expensive, and is committed to making food gardening low-cost and accessible. Lee generously shares her surplus harvest, saved seeds and garden knowledge with her neighbours, friends, family and local community. Her garden features a wide range of fruit and veggies such as potato, pumpkin, tomatoes, leafy greens, strawberries kiwiberries and even a banana palm. The sense of achievement and satisfaction Lee enjoys through growing something with her own hands and sharing / swapping seasonal excess with her neighbours is inspirational. 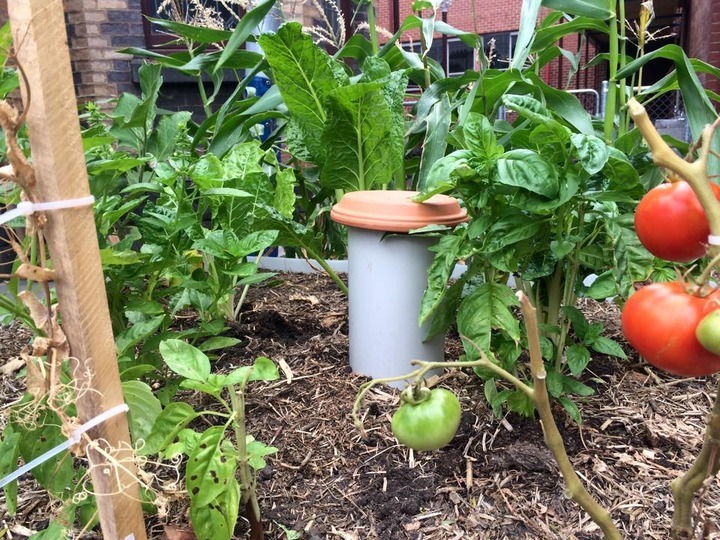 Lee’s garden demonstrates that growing and sharing food can bring the community together. Private address in Preston. Address provided on booking. 2:15PM - 3.15PM: This is a tour of Fotios and Effy's garden. Established 33 years ago, this garden is passionately tended by Fotios and Effy in their retirement. It features a cleverly grafted olive tree which produces 3 kinds of olives. Fotios believes in recycling, which is evident in the materials used to make the hot house and garden borders. This farm-let style garden produces fresh organic produce all year round, with tomatoes his speciality. Fotios believes his tomatoes are now a unique variety, because he has been saving seeds for 33 years. Seed saving selects for fruit best suited to local conditions, optimising flavour and quality, and helps preserve genetic diversity. The garden uses rain water tanks and homemade compost mixed with animal manure. 3:45PM - 4:45PM: This is a tour of Damian's permaculture garden. Damian has been enthusiastically practicing permaculture since he attended a talk by permaculture co-founder Bill Mollison in 1977. He is also involved in replanting native vegetation on Herring Island in inner suburban Melbourne. 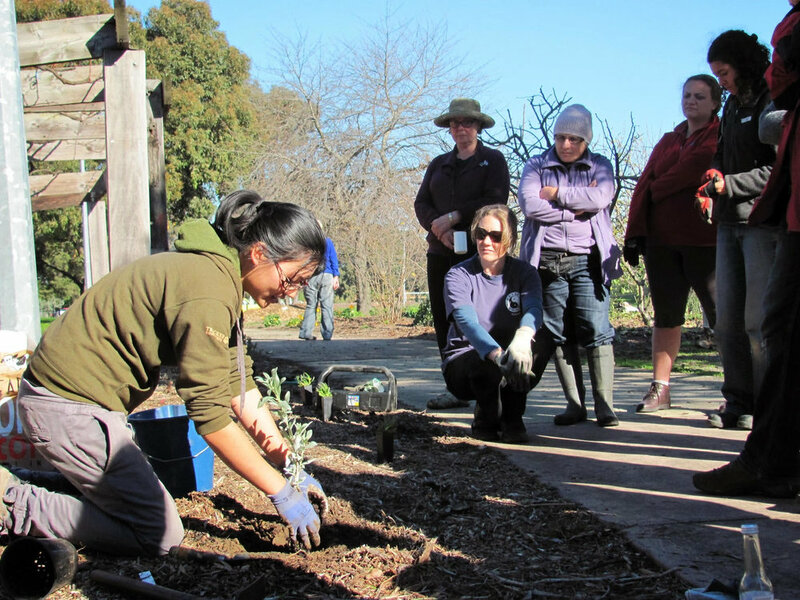 What permaculture and bush regeneration have in common is that they both aim to establish biodiversity whether building up microbes in the soil, integrating chooks and fruit trees or attracting wildlife to the garden. The complex mix of species form mutually beneficial relationships, all performing multiple functions such as nutrient cycling, pollination or pest control. Damian’s garden reflects his love of growing food for both humans and local native species. The gardeners will be holding a working bee, come join us! Please email condellgrowers@gmail.com for more information. Gnome Farming Co-op will be hosting an Open Garden Day at our Westgarth site, with tours of our Urban Garden and Verge space. Gnomes will be there to chat with people about what we do, how to join us, or how to start your own urban garden sharing community. There will also be a fundraising stall included with tasty treats, seedlings and succulents. There'll also be books and clothes with a bit of a garage sale vibe. Come down and get to know the Gnomes! Northcote area - numbers capped at 25 people, please mail riki@sustainaustralia.org with the subject title "The Plummery - RSPV" to recieve the address. 'The Plummery', is a small-scale 280m2 urban permaculture system which produces almost all the vegies, herbs, fruit and electricity consumed by the household (300kg in 2015), as well as recycling all organic waste on site. 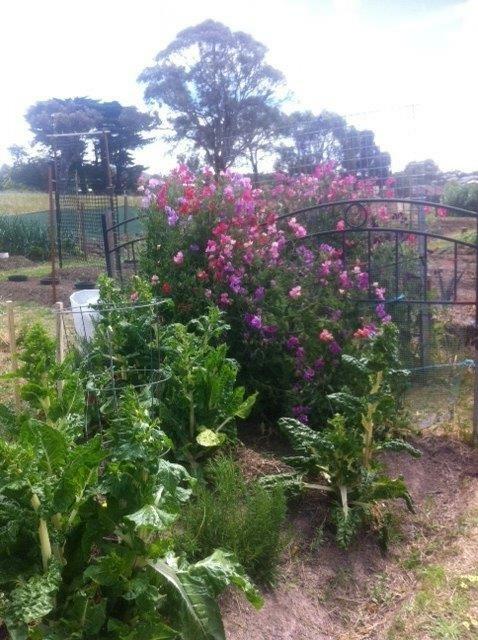 The owner Kat currently manages a popular sustainable gardening program, My Smart Garden, for Hobsons Bay City Council in the Western suburbs, and delivers freelance permaculture and gardening classes and coaching. Kat is also a volunteer coordinator of Permablitz Melbourne. Cuppa Tea and tour of the garden with CNLC's Head Gardener Sebastian Beck to explain the design and evolution of this garden into a multi use mini-urban farm providing a wide range of veggies and fruit for our multicultural community. The garden will be open all day, but there aren't any activities organised. Come and have look at our native edibles garden, extensive composting area and raised veggie beds. The garden will be open from 9am until 3pm. Phase One Coffee will be open and serving coffee and bagels. Garden open all day for you to browse, enjoy a fair trade coffee from our cafe and fair trade gifts too! Regular maintenance working bee by community volunteers, The tasks this Saturday include mulching, general liquid fertilising, and specific fertilising of vegetables and tomato's. Should we have time some weeding and pruning (wasp gall) would be useful. Visitors welcome. Come along and talk to the volunteers about how the garden came into being and how it operates. Full details at www.docklandsgarden.org! Note: The Darebin Backyard Harvest Festival will be taking place from November 19 - November 27, the festival features tours of home gardens as well as workshops on everything from aquaponics to food forests and more. For their full program, please see here.